I like RPGs. My friend also likes RPGs. But the other day we got to talking about the common practice of level grinding in the genre, something which I considered to be a tiresome chore, poor game design, and something that potentially robbed a game of its fun by decreasing its difficulty and the amount of strategy required. My friend, on the other hand, disagreed and said that he actually enjoys level grinding; and he's not the only friend of mine who does. 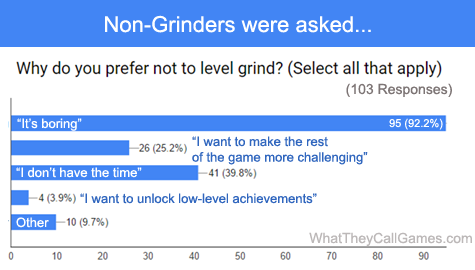 In fact, it seems that among my friends, I'm in the minority in my hatred of grinding. And so, to settle the debate, I asked the people internet about their play styles, specifically in regards to optional level grinding in offline, single-player RPGs. To make sure everyone was on the same page, I (and Wikipedia) defined "level grinding" as "engaging in repetitive tasks (e.g. fighting enemies repeatedly) in order to increase the strength of the player's character or party members". It's also worth noting that the vast majority of responses were given by users from the /r/SampleSize Reddit community who I asked only to participate if they had completed at least one RPG. 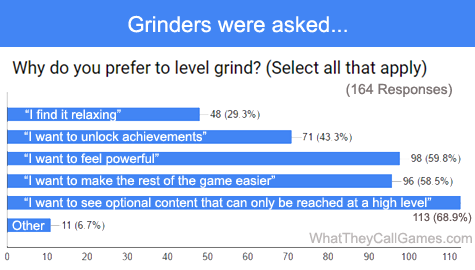 Respondents who admitted to preferred grinding were allowed to select as many of these generously understanding reasons which I supplied and even write in their own. In retrospect, perhaps I should not have included the "I want to see optional content that can only be reached at a high level" option because it arguably goes against the original stipulation of this being about grinding when the game doesn't require it. But since it was possible to select multiple answers, there was no harm done. A couple of the "Other" answers include wanting to get one's money's worth out of the game, and enjoying optimizing characters in general or using naturally weaker characters that would be unusable without some grinding. One person wrote in "sometimes it's necessary", willfully defying my "when the game doesn't require it" clause. I don't think these results are too surprising. Almost everyone who doesn't grind thinks it's boring and around 40% don't have the time to put into it. 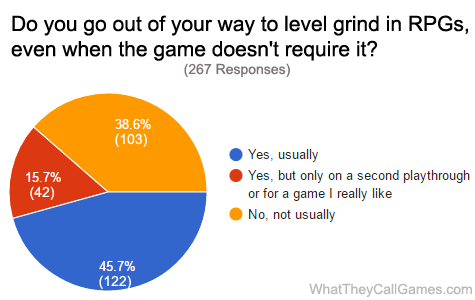 Most of the "Other" submissions on this one came down to players not finding it necessary to level grind because their completionist play styles, which often included doing side-quests, resulting in them getting plenty of experience already. One person wrote in "don't want to waste time", because presumably they have the time and just think it would be better spent on something else. If you'd like to take the survey, you can do it here, though I won't be updating this post with future results.